We are trying to bring awareness to the **Greatest Crime Against Humanity**. By strategically placing billboards, posters, and other media, such as train wraps and bus strips, we will be bringing awareness to the crimes being committed against Whistleblowers & Targeted Individuals. 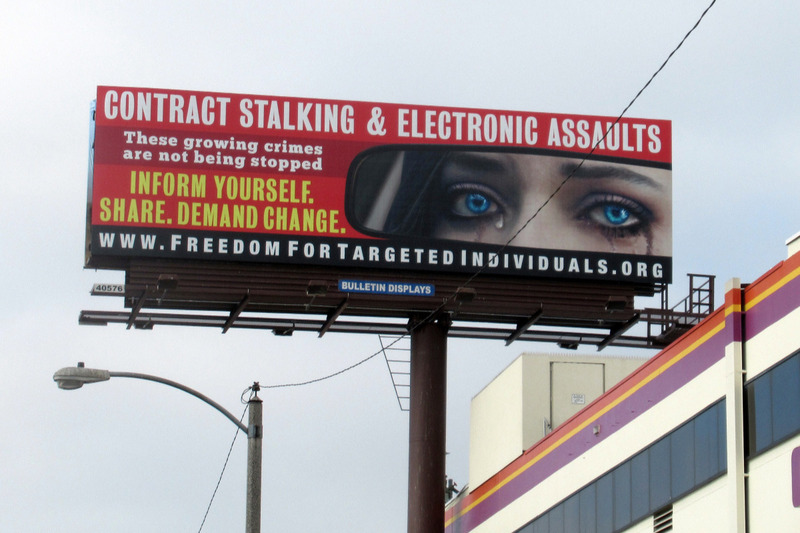 We already have a several billboards in Los Angeles (by LAX Airport, Beverly Hills, and West Hollywood) and one billboard in Boston. We also have two full-car-length train wraps and six SkyTrain station posters in Vancouver, British Columbia. Plans are in the works to put up a billboard soon in Lansing, Michigan. We are planning a worldwide campaign and are currently considering London and other parts of Europe, in addition to a number of U.S. cities. If we can raise enough money, we will be looking in your neck of the woods too! As you can imagine, this endeavor requires a substantial amount of money, but we are quite confident that this campaign will get people thinking, talking, and taking action against these atrocities. Donations of any size are much appreciated and will help us extend this public awareness media campaign as long as possible, with as much geographic coverage as possible. When you donate, please specify the region or city that you would like your donation to be applied to. While we cannot promise that we will be able to erect a billboard or other media in each specified city or region, we'll try our best to do so. A minimum total donation is needed to make each billboard or poster go up, and each one is pretty expensive. Nevertheless, any donation you make is guaranteed to help make important public awareness media go up somewhere in the world. All donations are strictly applied to media space rental costs. The development of media and management of the campaign is all being done by dedicated volunteers, who receive no compensation at all for this work. We dream of a world where all human beings can live without suffering. —The beautiful Martin Luther King Jr.